After months of engineering and development, cp-e™ is proud to release the Stage 2 ΔCore EcoBoost FMIC for the Mustang EcoBoost. We took what worked with our initial FMIC and pushed the envelope even further for the most powerful high horsepower builds. 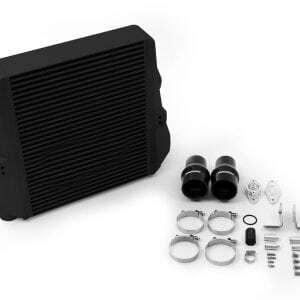 With several sponsored EcoBoost Mustangs outrunning V8’s with forced induction at the track, we knew that we needed to step up our cooling for the high power builds. 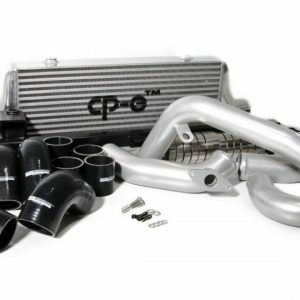 After months of engineering and development, cp-e™ is proud to release the Mustang EcoBoost FMIC. We took what worked with our initial FMIC and pushed the envelope even further for the most powerful high horsepower builds. With several sponsored EcoBoost Mustangs outrunning V8’s with forced induction at the track, we knew that we needed to step up our cooling for the high power builds. What Makes cp-e™ FMIC’s Different? 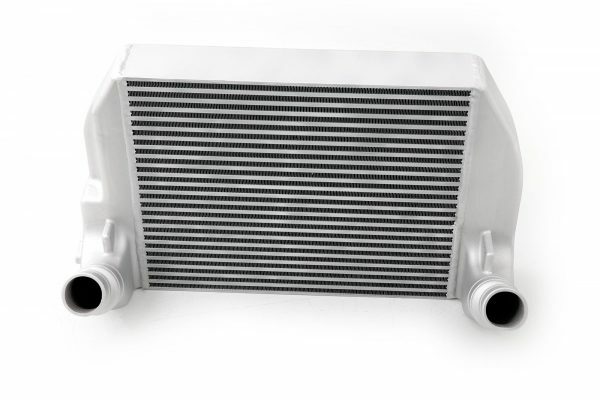 Due to the massive size, this core requires that the active grille shutters are removed. This is completely reversible and does not require permanent modification to the vehicle. cp-e™ started off by determining the maximum size core that could fit without irreversible modification to the vehicle. 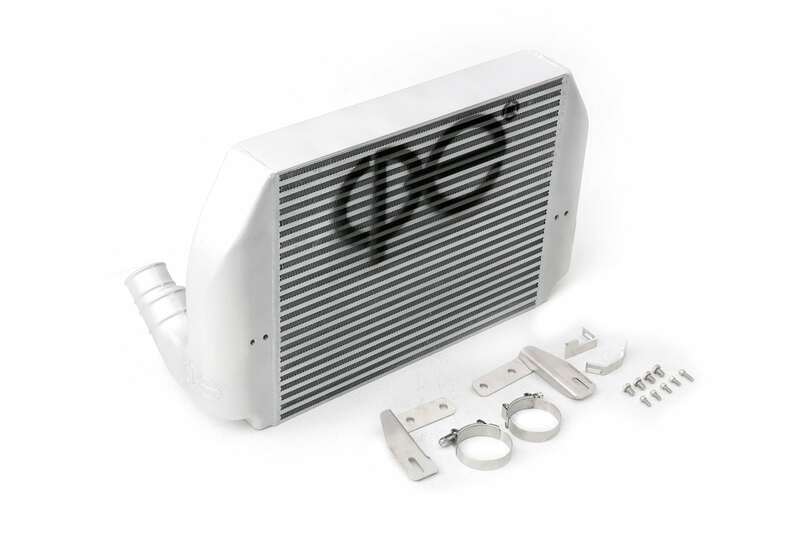 Our Mustang EcoBoost FMIC uses the bar and plate design to help ensure a high level of efficiency. cp-e™ then set their sights on designing the perfect EcoBoost FMIC endtanks, developing a design that not only encloses the monstrous core, but also requires no cutting, no drilling, and no permanent modification to the vehicle. 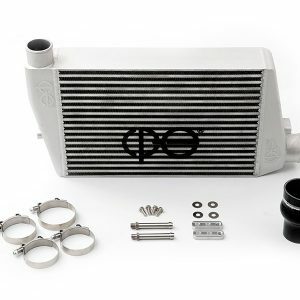 With the laser cut brackets, the intercooler will mount in the stock location while matching up to the stock intercooler piping. Customers can now upgrade their piping when their power demands need it and modify in smaller increments. 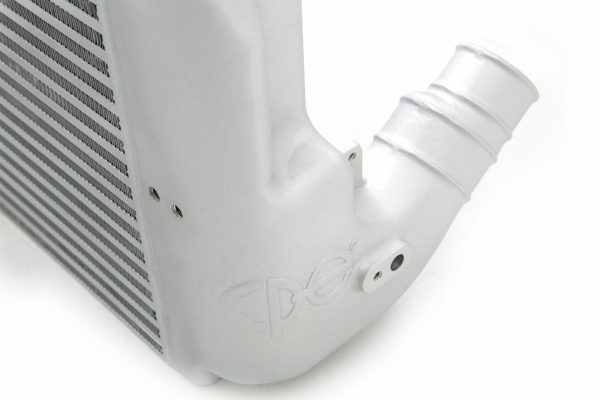 As always, the cp-e™ intercooler includes cast endtanks that are welded and pressure tested with the core. What sets these endtanks from the rest is the engineering behind their shape and internal design. Hours of design and computer flow diagrams have been put into the tanks’ design to virtually eliminate turbulence within them. Many times, upgrading an intercooler causes increased turbo-lag, and an overall pressure loss. This is because of the large size of the core and the turbulence within the endtanks. By designing the endtanks to be smaller, and more efficient cp-e™ has found a way to minimalize turbulence in order to keep the drivability of the car high, while still enlarging the intercooler drastically. The internal design of the endtanks directs the air to bring the most optimal airflow as well as an even distribution throughout the core. 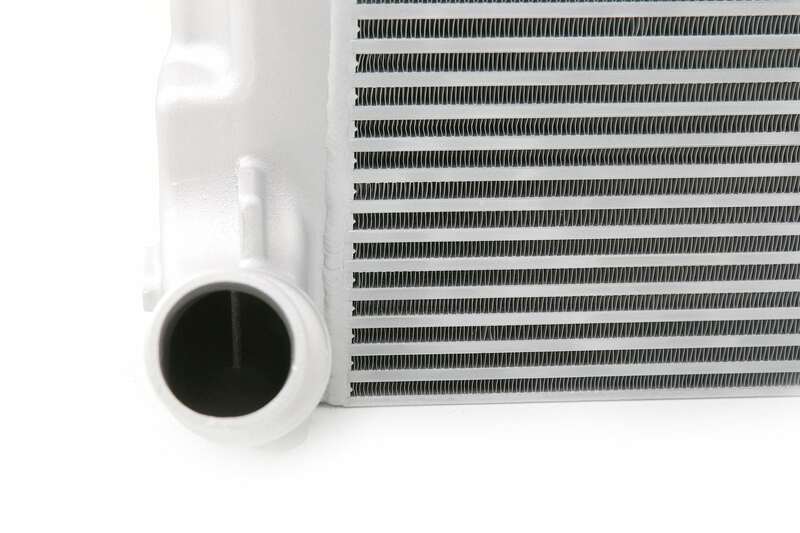 In intercoolers, the back half of the core only does 25% of the cooling. The endtanks have been designed to direct the air properly into the core for the most even cooling, giving the vehicle the most consistent conditions going into the engine. 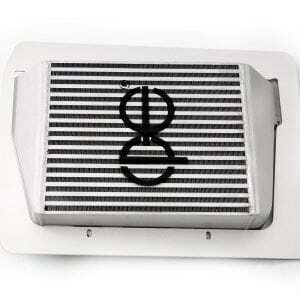 When creating an intercooler, the goal is to maximize size, while not increasing pressure drop. Larger cores almost always exhibit some form of pressure drop, due to the massive turbulence in a large core. cp-e™ has engineered a way around this by adding our carefully calculated turbulence reduction fins to smooth out the airflow from the end tanks to the main core. In the real world this translates to extraordinarily low pressure drop and no loss in spool times. When durability and high horsepower are the main goals, nothing beats casting. Cut and weld sections just don’t have close to the reliability of a cast piece. The problem is that casting is too expensive and out of reach for many manufacturers. 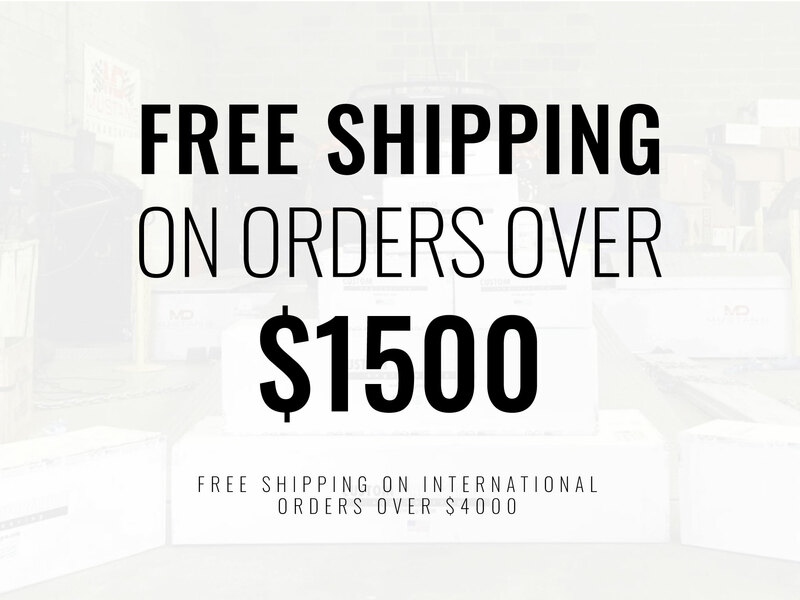 With the ultimate product as our end goal, we only accept fully cast end tanks for all of our front mount intercoolers. The EcoBoost platform has seen some incredible power gains in a very short period of time. 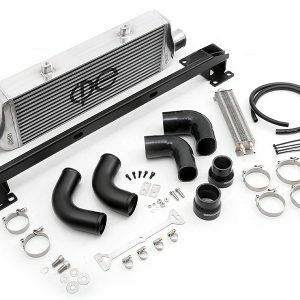 With this in mind, we wanted to create a very large intercooler that would support both stock and big turbo applications. Even with this large size, no modification or removal of stock parts are needed. 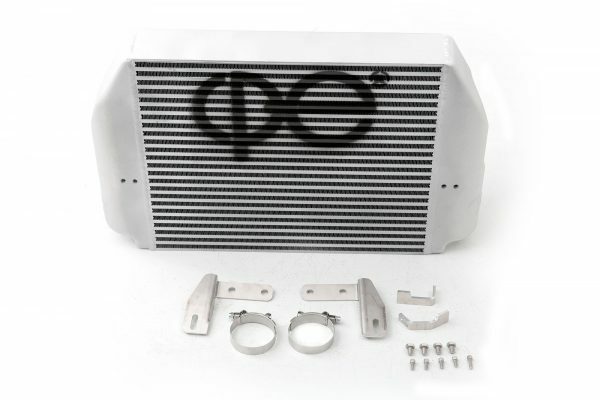 This combined with our fin design makes this intercooler the best choice out there for both stock and big turbo upgrades.